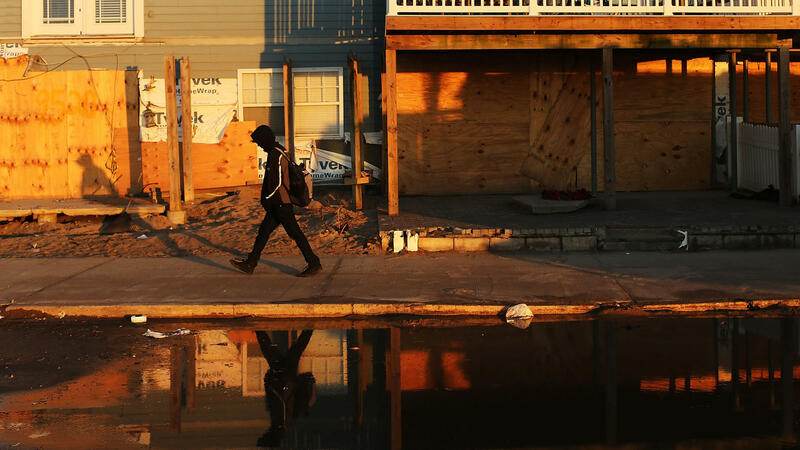 Disaster relief from the Federal Emergency Management Agency and the Department of Housing and Urban Development came to New York City communities like the Rockaways after Hurricane Sandy. Forecasters say the 2017 Atlantic hurricane season, which begins Thursday, could bring "above-normal" storm activity. Residents along the Atlantic and Gulf coasts are making sure they have supplies and plans in place if a storm hits. But this year there are concerns that the federal agencies in charge of dealing with disasters — from providing emergency relief to rebuilding homes — may be less prepared than usual and could be hampered by proposed budget cuts. Last year provided a reminder of why many say federal assistance is vital. In October, Matthew slammed into Haiti as a powerful Category 4 hurricane, killing more than 500. After that, it swept up the U.S. Atlantic coast, pounding communities like St. Augustine, Fla., where beaches were washed away and much of the downtown was underwater. Eight months after the storm, St. Augustine and surrounding communities are still recovering, spending millions to rebuild the coastline. The emergency manager of St. John's County, Linda Stoughton, says federal support for that effort is vital. "We understand disasters are local," Stoughton says. "We responded. But we are going to need federal funding to make St. John's County back to where it was." This year, key federal agencies that state and local governments and the public depend on still don't have leaders. Nearly five months after Donald Trump was sworn in as president, NOAA, the agency that oversees the government's weather forecasting, is still without an administrator, as is the agency that responds to disasters, FEMA. At least in the case of FEMA, the Federal Emergency Management Agency, a nomination is pending. The Trump administration has named the former head of Alabama's emergency management agency, Brock Long, to the position. FEMA is part of the Department of Homeland Security. After touring the National Hurricane Center in Miami Thursday, DHS Secretary John Kelly said Long should be confirmed as early as next week and that he is not concerned about FEMA's ability to respond to disasters. "We are ready to assist any state, any catastrophe, certainly in the case of Florida, hurricanes," he said. "So we're ready to go with it. FEMA is ready, leaning forward." FEMA's last director, Craig Fugate, who stepped down in January, says day-to-day operations at the agency are in good hands, so he is not concerned about a temporary vacuum at the top. He says, "The bigger challenge is longer term, is setting the tone and direction of the agency; being able to represent the agency in the policy discussions at the highest level of government." With no permanent administrator in place for those discussions, FEMA is one of the agencies that have been targeted for significant cuts under the budget the president submitted to Congress. Under that budget, a program that helps states and communities take long-term measures to reduce losses from disasters, the Pre-Disaster Mitigation Grant Program, has been cut by more than 60 percent. The budget also eliminates funding for an ongoing effort to improve and redraw the nation's flood maps. "This is a very harmful approach that's essentially saying that states are on their own, communities are on their own in terms of responding and recovering from these disasters," says Rachel Cleetus, a climate policy expert with the Union of Concerned Scientists. "And the reality is, states just don't have the budgets." For states and communities hit by floods, tornadoes, wildfires and other disasters, the Trump budget slashes another important source of recovery funds. The Department of Housing and Urban Development provides money that helps communities rebuild after a disaster, after FEMA has moved on. The Trump budget cuts that $3 billion fund to zero. Cleetus says the HUD funding has been a lifesaver to communities around the country. "It was certainly used after Katrina," she says. "It was used after Sandy. Most recently it was used last year, after Hurricane Matthew." St. John's County received more than $48 million from HUD after Matthew, money that is helping rebuild roads and some of the 1,400 homes affected by the storm. Asked about the proposed budget cuts for FEMA, Kelly said tersely, "We'll make do." And, as alarming as she finds it, Cleetus acknowledges that Trump's budget is unlikely to be adopted. Congress, not the president, determines how money is allocated to federal agencies. Fugate says FEMA has enjoyed stable funding since 2011 under a formula developed by Congress and the White House after Hurricane Irene. So despite the cuts to his former agency, Fugate says, "I don't get too excited when the president submits their budget. I wait until I start seeing what the appropriations chairs have to work with and what their initial marks are. Because that's a better indicator of what ultimately will get funded or not get funded." FEMA, like many other federal agencies, is likely to be squeezed, Fugate says. But the agency, its mission and its funding have broad bipartisan support among members of Congress — especially those from communities where FEMA has helped pick up the pieces.